Holy poop! How in the world am I in the middle of May already?!? The simple part of my Me-May-May 2016 pledge has been wearing refashioned clothes every day this month because most my sweatpants, shorts, and jeans have been altered or refashioned in some way. The more difficult part of the pledge has been refashioning five new items during the month. I have attempted a few refashions here and there but most turned out disastrous unless I can count all the new “screen printed” shirts (the book snake, the cat outline, etc.). 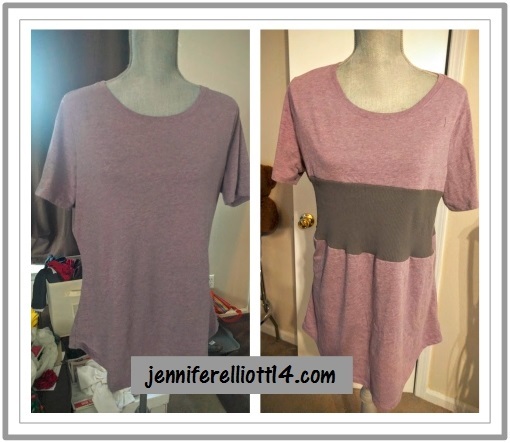 Between doing a few loads of laundry and trying a new pull-apart dinner roll recipe, I sat down and quickly sewed a simple shirt refashion. I took a cute purple shirt that was a little too small and made a straight cut about an inch below the armpits. I had an old grey tank top with a stain on it, cut a wide band out, and inserted it into the shirt. The stretchiness of the grey tank removed the snugness of the shirt and made it way more comfortable and cute. One refashion down four more to go — am I sure I can’t count the newly painted T-shirts?